Above: Select the required shipbuilder by using initial letter of the surname eg: Armstrong, Palmer or Readhead. William Cunningham built ships at St Lawrence, Newcastle, near the Mushroom Landing. Shipbuilders ‘Cunningham & Carr' are seen in 1839 lists at North Shore, Newcastle and it seems likely that William Cunningham, aged 36 years, is the one referred to in this firm. Cunningham had a gridiron and patent slips, building some fine wooden ships in his 20 years at the St Lawrence site, all this at a time when iron shipbuilding was ‘taking off' on the river. Like Gaddy & Lamb across at Tyne Main, he seemed to prefer the ‘old ways’. In the 1851 Census, he is a 48 year old, Newcastle-born Shipbuilder, employing 17 men and 19 boys. His nephew, George Cunningham Hutchinson was a 14 year old apprentice shipwright at that time. In about 1860, the Yard passed to this nephew GC Hutchinson and he carried on with wooden ships and finally built some paddle steamers. GC Hutchinson continued until about 1870. Later users of the site were probably Edward Lindsey until 1881, then the Browns, and the Anderson & Partner firms until about 1894. By the turn of the century shipbuilding had ceased there, and the site today is under the City Quayside extensions, near the Spillers Mill. Above is an extract from Tyne Shipyard Biographies, copyright of Ron French. 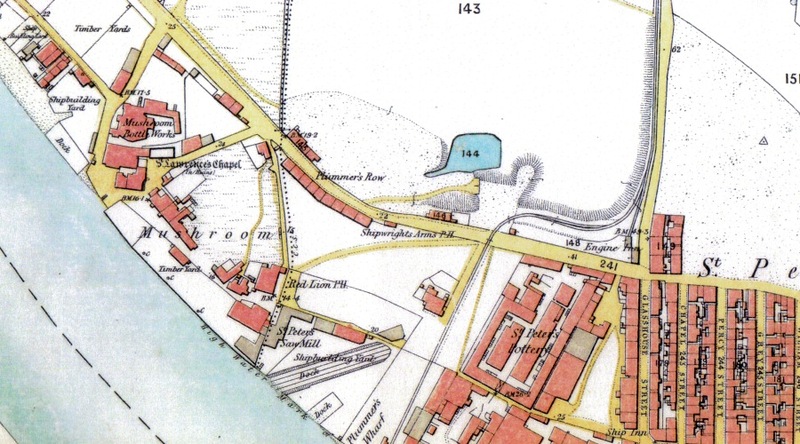 The above map is dated 1859 and is approximately 0.6 miles in width.